Grab your partner, do-si-do, circle left and … bust a move? Yes, that’s correct: Bust a move. Not the lexicon typically attributed to contradance, but then again, this isn’t going to be your normal folk dance experience. With dim lights, disco ball and a pumping sound system, this is anything but traditional. 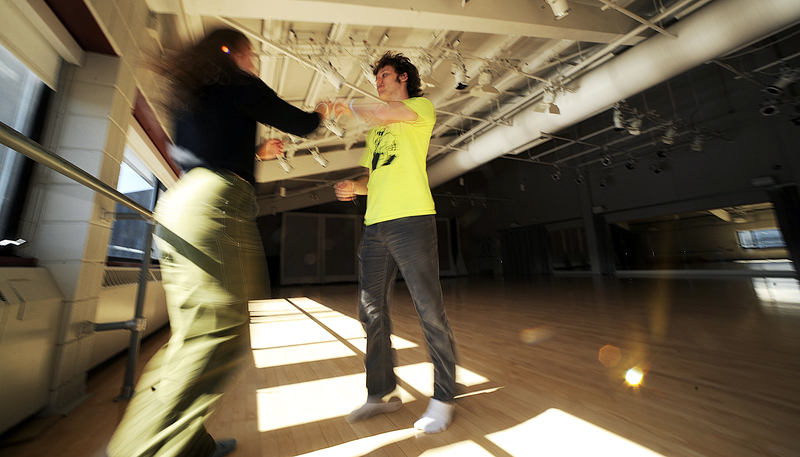 Bates College’s Freewill Folk Society, a student organization that plans folk dancing events at the college, is throwing its second alternative contradance following the success of a March 2009 hip-hop themed contra. Led by the organization’s president, Blaise Thompson, a college junior, with the help of folk dance caller Chrissy Fowler from Belfast, the event is gearing up to be a jammin’ good time. “It’s fun because it’s unique and even a little bit silly,” says Thompson. The hip-hop/alt theme gives the tradition a quirky update. 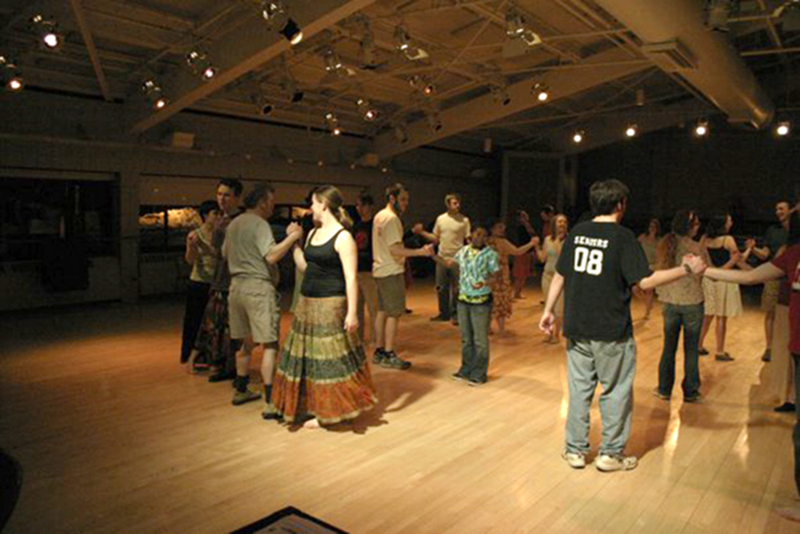 Originally the idea to host an alternative contradance came up at last year’s New England Folk Festival where Thompson and a fellow Bates student were introduced to the concept. “What we’re doing is in no way revolutionary,” explains Thompson. “Other contradancers have done this sort of thing.” The novelty and creativity of the idea interested the students and they decided to bring the concept back to Bates and the Lewiston-Auburn area, hosting their first convergence of dance cultures to all-around positive feedback from participants. Instead of the live jigs and reels, popular music and modern jams will boom from electronic sources. 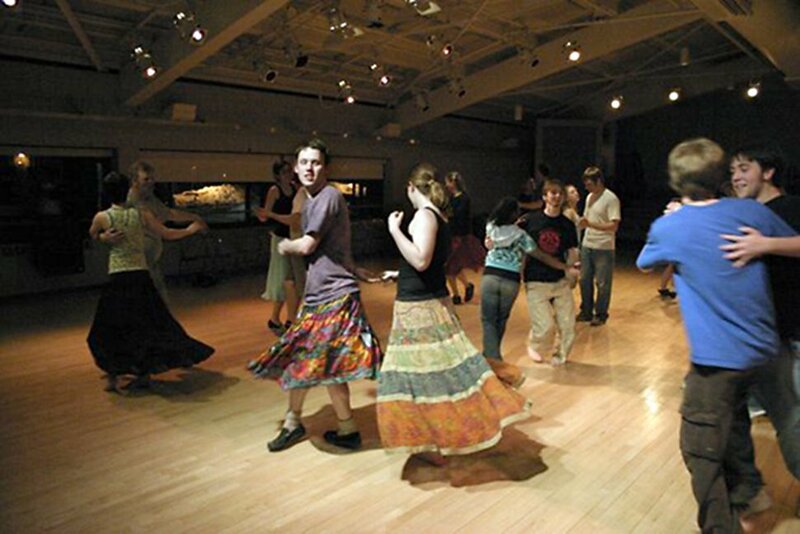 Although the Freewill Folk Society and Fowler in no way want to replace traditional contradance — especially the aspect of having a live band — this occasion offers something unique for those interested in trying something a little different. Seriously, how many contradancers have ever allemanded to MGMT or Jay-Z? “Musically, it inspires just a little different type of dancing,” says Thompson. At the March event, dancers did the buzz-step-swing (a contradance move where a couple in ballroom position puts weight on the right foot and pushes with the left foot like on a scooter) to a contemporary song like Lady Gaga’s “Poker Face” and proved that modifications were definitely needed. Noticing that holding on to the traditional form of the movement wasn’t working with these types of tunes, Fowler encouraged dancers to let their hair down and respond to the music, even doing an impromptu demo of how to let loose. “That got a few laughs,” she jokes. A lot of work is going into creating a playlist of techno, alternative and hip-hop music for the upcoming event. 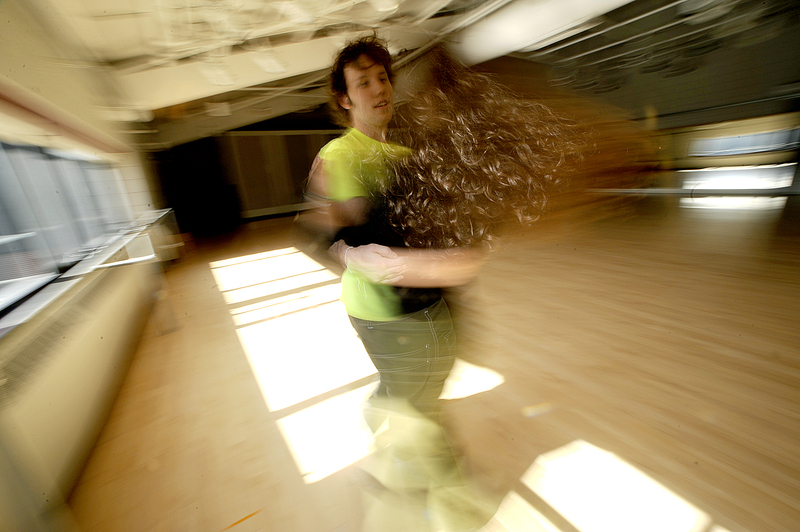 Thompson, with the aid of computer programs, is manipulating and splicing together songs so the beat falls into the common 16-count phrases familiar to traditional contradance. Regarded as an accepting, friendly bunch, contradancers welcome new members. There’s no dress code (women — and even some men — often don swirling peasant skirts as comfort is the name of the game) and evenings are usually chem-free. No experience? Not to worry. Not only will Fowler be calling the dances, but newbies will be paired with experienced dancers to help them get the hang of it. 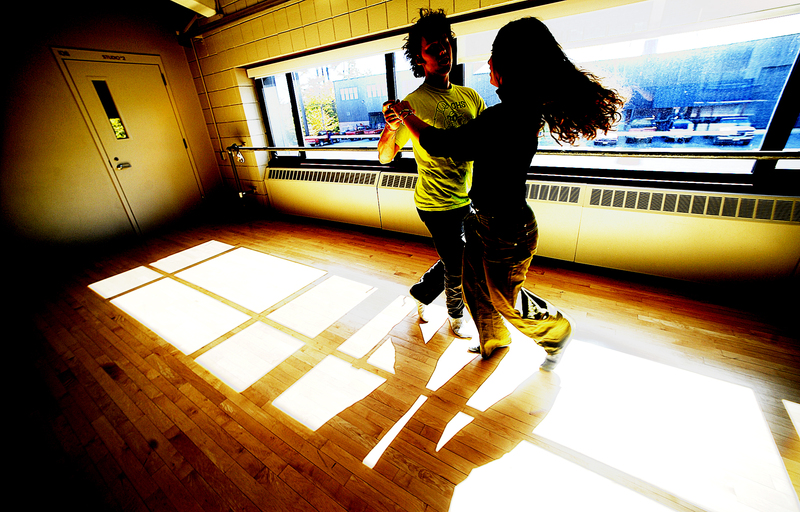 “This type of dance is about coming together and cooperating. In a lot of ways it doesn’t matter what the music is, because at the core is people collaborating with each other,” says Fowler. 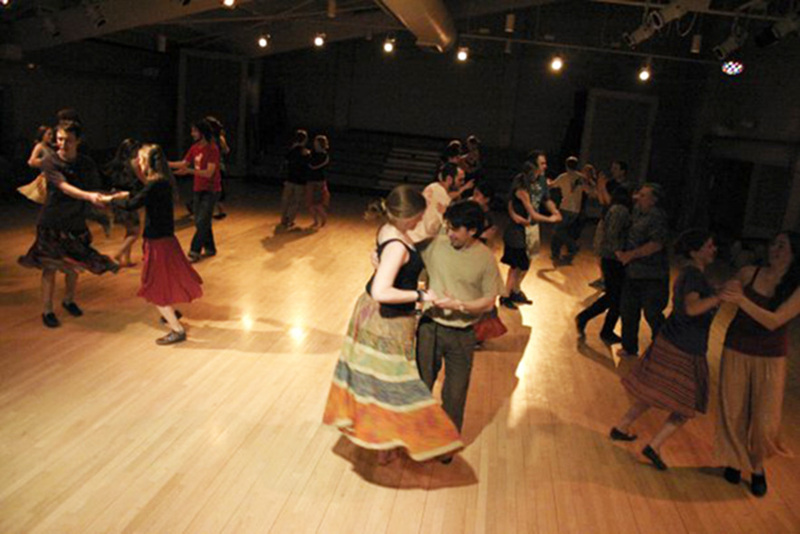 Hosting an unconventional contradance tends to attract an audience who wouldn’t normally attend a traditional dance, opening opportunities for locals and students to join the contra community.